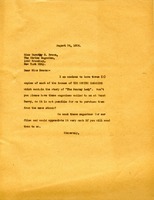 Letter to Martha Berry from Sewell Haggard informing Miss Berry that she can have the cuts free of charge but to let them know if she would all of them or only some of them. Mr. Haggard also informs Miss. Berry that the photographs were returned by the art department. 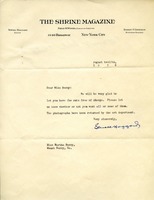 Letter from Martha Berry to Miss Brown of The Shrine Magazine requesting three copies of each issue of the magazine which contain the story of "The Sunday Lady" because they are no longer available from the news stands and they are needed for the files.